Carlo D'Agata, A. Z. (2007). "Reconstruction of the recent changes of a debris-covered glacier (Brenva Glacier, Mount Blanc Massif, Italy) using indirect sources: Methods, results and validation. "Global and Planetary Change 56: 57-68. The author used DEM’s derived from historical maps dating back to 1959 as well as photogrammetric surveys done in 1991 and 1997 to compare changes in the volume and thickness of the glacier tongue during the 2nd half of the 20th century. - These were composed of four digitized maps and two aerial stereo-pairs covering intervals of about 10 years from 1959 to 2003 (decadal scale seems popular in papers). -The DEM’s were derived from digitized historical maps. -What are “delaciation” and macro-gelivation processes? (First paragraph after abstract). -The tongue of the Brenva glacier has become completely separated from the upper accumulation basin. From the description of the methods they used it seemed like they used good logic to overcome the gcp’s for the 1997 orthophoto but I feel like the varying resolutions of the historic maps and the way they interpreted those could have introduced some error. -Getting past the very hard to see lines they describe in the surface elevation figures it was interesting to note that the glacier tongue was growing until 1991 then dramatically shrank in distance and retreated to higher elevation by 1997 and continued to do so through 2003. I wonder what the big difference was? 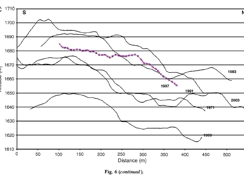 -But, the cross profile shows 2003 had the longest distance contradicting the longitudinal profile. In the discussion the paper talks about the tongue thickening and expanding and contracting in distance, but I’m a little confused.. are they talking about the thickness of the ice or the debris or the debris and ice? Perhaps there were several rock slides during the time to add to the thickness? Overall the paper cites an increase in average thickness over the years 1959 to 2003. They say that the results vary greatly from other results using the same methods on other Italian debris free glaciers which they say must be explained by the insulating effect of the debris. If it is thicker than the “critical value” the debris reduces ice ablation… and they site Ostrem 1959, Fuji 1977, and Mattson 1993, and Rana 1997… what is this critical value they are talking about and how is it obtained? -They do admit that using two different reconstruction techniques may have introduced errors but they also noted others studies showing growth in volume of other Italian debris-covered glaciers. -The paper then goes into several pages of describing how they accounted for DEM accuracy using several equations but I don’t think this will apply to my work because I’m using LiDar as a base from Watershed which I know is accurate. -Perhaps I can find DEM’s of the years I pick for each mountain.. or close to it to help calculate volume changes. -Haha! I was right! At the end of the paper they discuss how the large volume increase from 1997 to 2003 doesn’t match with global warming trends during that time and high temps in 2003 so they propose it could have been linked to a large avalanche in 1997 in the area… But these are just hypotheses… that need to be tested. They conclude by saying that using indirect sources such as DEM’s derived from old maps and Orthophotos will become increasingly important with remotely sensed data taking a supporting role. Perhaps I can do the opposite with my research and try to incorporate some indirect sources as well into my final analysis as support. This was a very interesting paper. I will try to find various DEM’s for both Hood and Rainier so that perhaps I can use some indirect sources in my analysis as well to help support what I find from the Landsat Data analysis. D'Agata, C., Smiraglia, C., Zanutta, A., Mancini, F., 2005. The recent variations of a debris covered glacier (Brenva Glacier) in the Italian Alps monitored with the comparisons of maps and digital othophotos. Journal of Glaciology 52, 183–185. Florinsky, I.V., 1998. Accuracy of local topographic variables derived fom digital elevation models. International Journal of Geographical Information Science 12 (1), 47–62. Rana, B., Nakawo, M., Fukushima, Y., Ageta, Y., 1997. Application of a conceptual precipitation–run off model in the debris-covered glaciarized basin of Langtang Valley, Nepal Himalaya. Annals of Glaciology 25, 226–231.